Built ca 1857 for Simeon Hall. Simeon Hall was, by his own account, a lumber dealer. City directories for 1852 & 1858 listed him as a ‘surveyor. This duality is a bit odd but not without warrant in Simeon’s case as he billed the city $13.28 for “lumber furnished for schools” in 1844 and he did survey new streets in the city as we shall see. He was born in Portland in 1781. It’s interesting to note as he died in 1870, Simeon Hall witnessed the end of the Revolution, the War of 1812. The Mexican War and the Civil War. Truly a window on the making of the nation. Simeon Hall lived his entire adult life in the same house on Cumberland Avenue. The site of this home is now under the parking lot between Chestnut and Stone Streets. He and his brother George, who lived around the corner on Chestnut, owned a large piece of property running all the way to the flats of back bay. They would, in the 1840’s, layout and plat Cedar Street from those holdings. Congress Street and Munjoy Hill in the 1840’s. Charles Quincy Goodhue 1895. From Mr Goodhue Remembers Portland. Scenes from the 19th century. 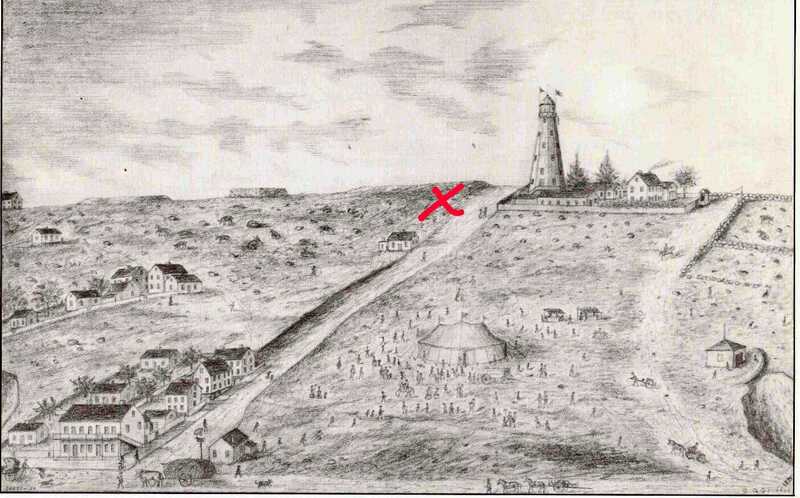 The red X marks the approximate location of our subject. The property for our subject had come to Simeon from his brother George in 1856. I’m not sure when George acquired it as it seems to have been connected to the estate of the Reverend Samuel Deane. Simeon sold the land, with the house, to Ann Freeman, his daughter, in 1858. He died in 1870. The house is a fairly conservative 2 bay by 2 storey brick block with an extending rear ell. 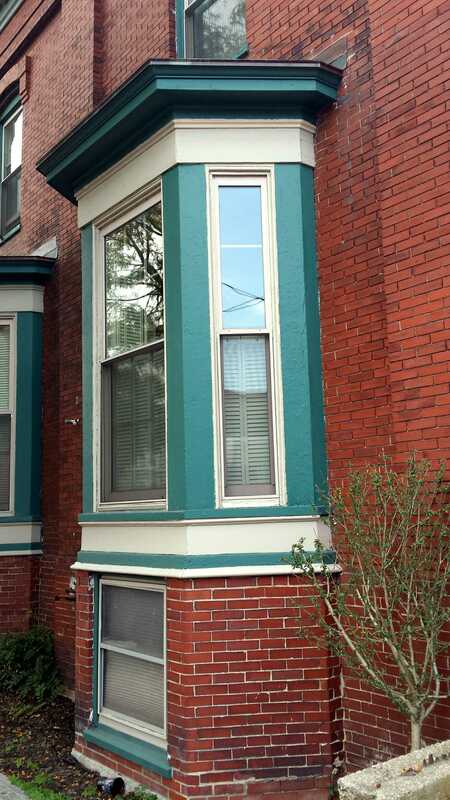 The details are limited mostly to a dentil line at the cornice and italianate hoods of brick over the windows. The street facade shows 2 recessed areas covering most of the wall into which the windows are set. These recessed segments create a simple pier and bay effect that is reminiscent of the brick Geek Revival work done in Portland in the 30’s and 40’s. Entry is on the ‘downhill’ side in the now enclosed porch. In 1893 Charles Freeman sold the property to Georgia Farnsworth. Ann had died in 1874. There does not seem to have been any will or probate recorded but Charles was the eldest child af Daniel and Ann so the estate would logically go to him. Georgiana, or Georgia or Georgie, Hawley was born in Ascutneyville Vermont in 1851. She married Arthur Farnsworth, a New Hampshire native, in 1870. They would have 2 children, Arthur Jr and Myra, while living in Vermont. By 1880 they were living on Oxford Street in Portland. Arthur listed his occupation in 1880 as a clothing merchant but by 1900 he was a deputy railroad postal clerk earning $900 a year. In the spring of 1903, James Hamilton purchased the next house up the street from the Farnsworths. At that time, it was discovered that the bay window stack on the side of the house, seen in the photo above, was actually on his land. The land for the bay was transferred to Georgia and can be seen as the 2′ x 10′ bump on the tax map. Dennis and Richard were born in 1853 and 1861 respectively. Their parents, Richard and Ellen, were Irish immigrants who arrived sometime prior to 1858. A christening record from 1823 would suggest Richard senior was from the Limerick area. Census records document Dennis’ rise from a laborer to manager of a team of masons which was his father’s trade. Richard followed a similar path becoming a plumbing inspector for the city of Portland around 1910. Dennis, Richard, Margaret and Mary Griffin would live at 147 Congress Street for the remainder of their collective lives. As none of them ever married, the property ended up with a cousin, Arthur Devine, who was a resident of Boston, MA. He sold it to Edward and Bernard Devine in 1949. The current entrance is a bit worse for wear but is a decent job at enclosing the porch. I particularly like the juxtaposition of the mullions of the door and the window above. Edward and Bernard Devine were born in South Portland in 1923 & 1925. They both served in WWII. In 1955, the year after their father John died, they transferred ownership to his widow Mary. Mary sold it in 1963. I don’t think any of the Devines ever lived in the house as all the deeds involved give South Portland as their residence. The next owners, Glenn and Hazel Smith, sold the property, 7 months after they bought it, to Bernard and Gloria Powers. History is limited for the Powers. It appears Bernard was born in 1935 & Gloria in 1939. They owned 147 Congress Street until 1981. The house would pass through several owners for the next 35 years serving as an apartment house with 4 units. In 2014, it was purchased by the development group that was renovating the former market and apartment building at the corner of Congress and North Streets. The primary purpose of this purchase was to provide parking spaces for the condominiums being created at 137 Congress. To achieve this, the useage of 147 Congress Street was changed to single family. This allowed 2 of the 4 parking spaces behind the building to be assigned to 137 Congress and the remaīning 2 assigned to our subject. Once renovations were complete, the house was sold to the current owners, a couple from Harvard Mass. This entry was posted in Architecture, Brick, Condominium, Congress Street, East End, History, Images, Munjoy Hill, Then & Now and tagged 19th Century, Architecture, Brick, East End, History, images, Italianate, Maine, Munjoy Hill, Portland on October 30, 2017 by alewifecove. How wonderful. These things are all around us but we don’t really see them. Thanks for the illumination.